Delaware 404 extends Maryland 404 east from rural Caroline County to Bridgeville, Georgetown and Five Points in the vicinity of Lewes and Rehoboth Beach. Delaware 404 is the preferred route for through traffic between the Eastern Shore of Maryland and the Delaware beaches. Entering Sussex County along Seashore Highway, SR 404 passes through the rural settlement of Adams Crossroads to SR 36 at Scotts Corner. SR 36 stems east to Greenwood, while SR 404 stays on Seashore Highway southeast toward Bridgeville. The state route bypasses Bridgeville to the north along Newton Road to U.S. 13 while SR 404 Business travels through the heart of town along Market and Main Streets. U.S. 13 & SR 404 overlap south along eastern reaches of the Bridgeville corporate boundary to South Main Street and Seashore Highway. U.S. 13 Business & SR 404 Business end from the west as SR 404 rejoins Seashore Highway southeast. The signalized intersection between the four routes was realigned in 2008 so that both roads meet at a 90 degree angle. Beyond the growing retail and residential development in south Bridgeville, Delaware 404 (Seashore Highway) angles southeast to merge with Delaware 18 (Cannon Road) ahead of the Nanticoke River. Delaware 404 ended here until sometime after 1985, when the route was extended along side Delaware 18 (Seashore Highway) east to Coverdale Crossroads and U.S. 9 (Market Street) at Georgetown. SR 404 combines with U.S. 9 east as SR 18 ends. A roundabout joins the three routes at Bedford and Market Streets in Downtown Georgetown. U.S. 9 & SR 404 overlap east from the Sussex County seat along Lewes Georgetown Highway to Gravel Hill (SR 30) and Harbeson (SR 5). Increasing suburban development lines the two-lane highway as it advances east to Cool Spring, Belltown and SR 1 (Coastal Highway). 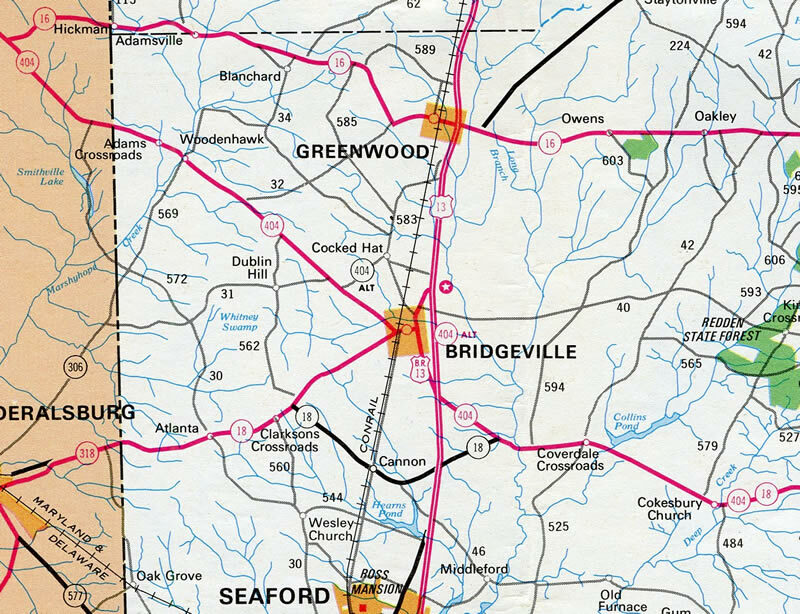 A traffic study was undertaken in 1986 on the increasing congestion along east-west routes in Sussex County, including U.S. 9, SR 18, SR 26, SR 54 and SR 404. The study was coordinated with Maryland highway officials.1 A subsequent development in 1988 called for a consultant to design improvements to an east-west traffic corridor between Bridgeville and the Lewes area.2 The Sussex East-West Corridor Study was initiated by DelDOT in March 1989 to further advance recommendations from the previous studies for improving traffic along SR 404, SR 18 and U.S. 9. Included were alignments for bypasses around Bridgeville and Georgetown. 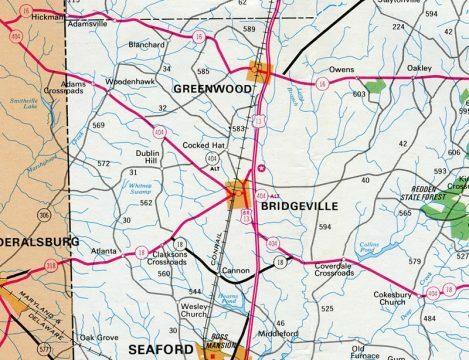 The proposal for an east-west freeway in Sussex County reemerged with House Transportation Committee authorizing DelDOT to undertake a feasibility study for a new road on June 2, 2004. Rep. Gerald W. Hocker, R-Ocean View referenced a previous feasibility study conducted in the late 1970s, which outlined a new route that was thought to be too costly. Since that time, Sussex County underwent substantial growth both with new residents and growing tourism appeal. With population figures expected to grow another 33% over the ensuing ten year period, Hocker and Sen. George H. Bunting Jr., D-Bethany Beach sponsored a resolution to address the growing traffic concerns.3 No capacity changes have been implemented since 2004, with the exception of a realignment onto a four-lane arterial between U.S. 13 and Bridgeville Center Road to accommodate new retail development. Originally SR 404 took Seashore Highway southeast to Market Street and Main Street (U.S. 13 Business) through the town of Bridgeville. Newton Road east to Adams Road at Cocked Hat and U.S. 13 (Sussex Highway) was designated as the northern leg of SR 404 Alternate by 1990. The alternate route overlapped with U.S. 13 south back to SR 404 (Seashore Highway) along its east leg. The bypass route was created in an effort to shift through traffic away from the historic town. Construction to the north of Bridgeville eventually reconfigured the split intersection of Adams and Newton Roads so that Newton Road traveled seamelessly. This led to the SR 404 relocation over SR 404 Alt in 1999, with SR 404 Business designated along the previous mainline route along Market and Main Streets town. SR 404A appeared on the Official Delaware Highway Maps from 1990 to 1997. A welcome sign greets eastbound motorists along Delaware 404 (Seashore Highway) just past the state line. Photo taken 01/15/17. 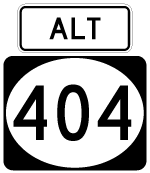 The first confirming marker for Delaware 404 follows as Seashore Highway advances east toward Adams Crossroads. Photo taken 01/15/17. Adamsville Road travels north from Adams Crossroads to SR 16 at Adamsville and south back into Caroline County as Bloomery Road. This reassurance marker follows the Adamsville Road intersection with SR 404. Photo taken 01/15/17. Drivers continuing east along SR 404 (Seashore Highway) cross Marshyhope Creek to the settlement of Woodenhawk. Photo taken 01/15/17. Tull Road and SR 36 (Scotts Store Road) intersect SR 404 at back to back intersections from Scotts Corner. SR 36 begins here and leads northeast 3.60 miles to combine with SR 16 outside Greenwood. Photo taken 01/15/17. Delaware 36 travels 23.28 miles overall from Scotts Corner to Cedar Beach off Delaware Bay. Photo taken 01/15/17. SR 36 provides an alternate route to the Delaware beaches from SR 404 in conjunction with SR 16 east from Greenwood to SR 1. The state route otherwise ventures northeast to Milford. Photo taken 01/15/17. A set of flashers caution motorists as the rural split of Delaware 36 (Scotts Store Road) east from Delaware 404 (Seashore Highway) east. Photo taken 01/15/17. This mileage sign references the distances to Bridgeville (4 miles), Georgetown (16 miles) and Rehoboth Beach (34 miles) via the original alignment of SR 404 east. With the SR 404 relocation to bypass Bridgeville, the Georgetown city limits are now 17 miles away, while Rehoboth Beach is 37 miles to the east via SR 404, SR 1 and SR 1A. Photo taken 01/15/17. SR 404 splits with SR 404 Business (Seashore Highway) to bypass the town of Bridgeville along Newton Road east and U.S. 13 south. Photo taken 01/15/17. Erroneous U.S. 404 shields were previously posted ahead of the SR 404 and SR 404 Business separation. There once was a U.S. 104 in upstate New York, but never a U.S. 404. Photo taken 04/13/04. Delaware 404 circumvents Bridgeville to the north along Newton Road for 2.12 miles. Delaware 404 Business follows the old alignment on Seashore Highway southeast 1.40 miles to Market Street in town. Photo taken 01/15/17. Long distance travelers headed for the Cape May-Lewes Ferry are directed to remain along Delaware 404 east to bypass Bridgeville. The business route is 1.2 miles shorter than the Delaware 404 mainline. Photo taken 01/15/17. SR 404 makes a protected left turn from Seashore Highway to Newton Road. Motorists taking SR 404 Business south meet U.S. 13 Business in 1.84 miles within the Bridgeville historic district. Photo taken 01/15/17. Delaware 404 was realigned onto Newton Road in 1999 over what was Delaware 404 Alternate. The alternate route was created in 1990 over two sections of Newton Road. Photo taken 01/15/17. 1990s construction realigned Newton Road to eliminate a dog leg along Adams Road at the settlement of Cocked Hat. Photo taken 01/15/17. Newton Road straightens out east from Adams Road to intersect U.S. 13 in an industrial area north of Bridgeville. Photo taken 01/15/17. North from Bridgeville, U.S. 13 (Sussex Highway) varies with rural stretches between the small towns of Greenwood, Harrington and Felton ahead of the suburban corridor from Camden north into Dover. The US highway travels the height of Delaware along a 103.33 mile route from Delmar to Claymont. Photo taken 01/15/17. Delaware 404 east shares a 2.5-mile concurrency with U.S. 13 (Sussex Highway) south along the east side of Bridgeville. Photo taken 01/15/17. Newton Road extends east from U.S. 13 and Delaware 404 to end at Fawn Road nearby. Photo taken 01/15/17. A pair of reassurance markers for U.S. 13 & SR 404 line Sussex County south after Fawn Road. Photo taken 01/16/17. Redden Road provides an alternate route to Georgetown by way of Kings Crossroads and U.S. 113 south at the succeeding traffic light. Photo taken 01/16/17. Running along the east side of Bridgeville, U.S. 13 & Delaware 404 (Sussex Highway) advance south from Rifle Range Road to split at Seashore Highway. Photo taken 01/16/17. A series of signs attempts to separate beach bound motorists to use SR 404 east for Lewes, Rehoboth and north Delaware beaches and U.S. 13 south to SR 20 for Fenwick Island and Ocean City, Maryland. Photos taken 01/16/17. Delaware 404 rejoins Seashore Highway east from Bridgeville to Georgetown. Delaware 18 accompanies the route to U.S. 9. Photo taken 01/15/17. The south end of U.S. 13 Business is not signed from either direction of Sussex Highway at Main Street. SR 404 Business follows Seashore Highway west from Bridgeville to SR 404 at Newton Road. Through trucks are prohibited from the route. Photo taken 01/15/17. SR 404 parts ways with U.S. 13 and curves southeast along a commercial arterial. This is the only four-lane section of the state route in Delaware. Photo taken 01/15/17. Tatman Farm Road and Bridgeville Center Road form an arterial belt route south from Rifle Range Road around the Bridgeville Commons retail development. Photo taken 01/15/17. A reassurance marker for SR 404 east finally appears as Seashore Highway reduces back to two lanes beyond Tatman Farm Road. Photo taken 01/15/17. Delaware 404 bee lines southeast across agricultural areas to merge with Delaware 18 (Cannon Road). Photo taken 01/15/17. Delaware 18 & 404 (Seashore Highway) advance east across the Nanticoke River. Photo taken 01/16/17. Coverdale Road north and Chaplins Chapel Road south come together at Delaware 18 & 404 and Coverdale Crossroads. Photo taken 01/16/17. Seashore Highway turns southeasterly from Coverdale Crossroads to Collins Creek. Photo taken 01/16/17. Delaware 18 & 404 east next cross Gravelly Branch and Collins Pond at Collins Mill. Photo taken 01/16/17. Traveling south of Pine Hill along SR 18 & 404 (Seashore Highway) east. The state route curves east ahead between tracts of Redden State Forest. Photo taken 01/16/17. Delaware Technical & Community College (DTCC) appears along the eastern horizon as SR 18 & 404 nears western periphery of Georgetown. Photo taken 01/16/17. Motorists on SR 18 & 404 enter the Georgetown limits ahead of Vaughn Road south. Photo taken 01/16/17. Vaughn Road stems south from Seashore Highway by the Owens Campus of DTCC to Asbury Road. Photo taken 01/16/17. Continuing east, commercial truckers bound for U.S. 9 east to Five Points are advised to use U.S. 9 Truck to bypass Georgetown. The truck route is poorly posted along U.S. 113 south until its turn onto Bedford Street. Photo taken 01/16/17. U.S. 113 constitutes the main north-south route through central Sussex County southward from Delaware 1 at Milford to the Maryland state line at Selbyville. Interests to the southern Delaware beaches and Ocean City are encouraged to take U.S. 113 south to connecting east-west state routes in lieu of SR 404. Photo taken 01/16/17. Carmean Way loops north to big box retail from a set of flashers on SR 18 & 404 across from the Owens Campus of DTCC. Photo taken 01/16/17. Gas stations and fast food franchises line U.S. 113 north and south of its intersection with Delaware 18 & 404. U.S. 113 runs west of the Georgetown street grid along a four-lane arterial. Photo taken 01/16/17. U.S. 113 south links Georgetown with Millsboro, where Delaware 20 ties in from the west. Further south, the two separate ahead of Dagsboro, with Delaware 20 angling southeast to Fenwick Island. Photo taken 01/16/17. U.S. 113 north leaves the retail corridor through Georgetown through portions of Redden State Forest on the 13-mile drive to the south Milford city limits. A trailblazer for U.S. 9 Truck directs motorists southward on U.S. 113 for 2.7 miles to Bedford Street. U.S. 9 Truck follows a convoluted route south of Georgetown by Delaware Coastal Airport (GED). Photo taken 01/16/17. The last shield for SR 18 east stands along Bridgeville Road after U.S. 113 (Dupont Boulevard). Photo taken 01/16/17. SR 18 & 404 arc southeast from Bridgeville Road onto Bedford Street through residential areas of north Georgetown. Photo taken 01/16/17. Delaware 18 ends at U.S. 9 (Market Street) in Downtown Georgetown while Delaware 404 merges with the route east to Five Points. Photo taken 01/16/17. One block ahead of the Bedford Street roundabout with Market Street (U.S. 9) on SR 18 & 404 east at Laurel Street. The Sussex County Courthouse resides on the southeast quadrant of the rotary. Photo taken 01/16/17. A small guide sign references the U.S. 9 (Market Street) west and Bedford Street south connections with U.S. 113 instead of the continuation of Delaware 404 east along side U.S. 9 east. Photo taken 01/16/17. Formally known as the Circle, traffic entering the roundabout from SR 404 east first meets U.S. 9 (Market Street) west. Orientated east-west in Delaware, U.S. 9 concludes a 30.89 mile route at U.S. 13 in Laurel. Photo taken 01/16/17. "Sussex traffic study set." The Morning News (Wilmington, DE), April 25, 1986. "Road work planned." The Morning News (Wilmington, DE), January 5, 1988. "Bill proposes highway study: New Sussex roadway eyed." Delaware State News, June 2, 2004.